Introducing new ways of relating to and caring for the customer by applying new systems of interaction and communication through digital technology is a ‘must’ for retailers today. Digital signage is a fundamental key of everywhere commerce. It helps brands to interact with the clients, who are used to searching for information through the display on their mobile phones and tablets, opening new business horizons. As the consumer changes, so does in-store communication, which aims to inform, but above all, to attract and engage the customers. The evolution of behavior, greatly affected by the use of internet and mobile technologies, has a strong impact on retailers, who must have a better understanding of the new habits of potential customers when they are looking for information on the brand, the products, and the services available inside and outside the points of sale. Why this need? Because, according to the analysts latest data, today 70% of Italians are omnichannel. This means looking at new types of targets, and also new types of business. The latest research by Milan Polytechnic, in fact, shows that today those over 14 years of age perfect the buying process through a mix of physical and digital touch points, following a non-linear path. Therefore the study of the consumer, and of the evolution of the buying process, is fundamental for all distributors. Nowadays clients buy what they want, wherever they want, and when they want, since they have new, unlimited possibilities of purchase and relationship, that are increasingly complementary. This is the phenomenon of everywhere commerce: the experts underline how fundamental it is for the brand to be available to the consumers when they approach any physical or digital touch point. Multiplying these touch points for in-store communication must be part of a wider strategy, always on. The target of omnichannel customers represents a huge share of the market. To better understand how customers have changed in Italy, it is enough to note that out of a population of 59.80 millions, there are 39.21 internet users ( up 4% from 2016), and 31 million people active on social networks (52% of the population). 96% of Italians have a mobile phone (of which 70% are smartphones), and 31% have a tablet. 28 million people (47%) are active on social networks through mobile phones, up 17% from 2016 (Source: We Are Social 2017). In more detail, 59% of Italians, when buying use their smartphone to look for information (Source: Osservatorio Innovazione Digitale Retail – Polimi 2016), and 64% of Italian consumers trust the comments posted on social networks more than what they read on newspapers and magazines (Source: Nielsen 2016). In short, the tendency of consumers to interact with a display in order to search for, and to exchange information, is leading the distributors to understand how digital signage is the natural extension of an in-store communication that can guarantee customer seamless experience, in support of customer relationship management, and of customer experience management. The latest generation of digital signage is, in fact, the ideal window of interaction that puts clients and brand in direct contact. 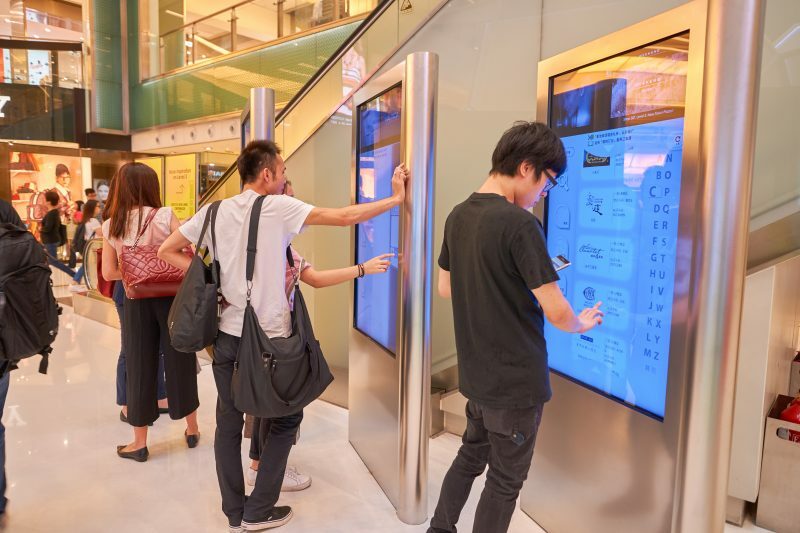 There are many points in favour of this technology, which offers advanced means of interaction, designed to make the use of screens of many shapes and sizes simpler and more intuitive, guaranteeing support both to the store personnel and passing shoppers. The aesthetic impact of the digital media is very strong: the screens are not simple displays, but thanks to the versatility of the latest generation of capacitive touch surfaces, they become to all effects strategic furnishings. Moreover, the advanced management platforms of the programme schedules make it possible to vary the communication, in centralised mode, alternating information videos with offers and promotions. Combining messaging, advertising, and entertainment, digital signage enables an in-store communication that maximises governance. This makes possible not only the tracking of the navigation mode of customers looking for information, but also to monitor campaigns and check the feedback of marketing initiatives through advanced systems of reporting and analysis.